Although our schedules don’t always line up, if Ryan and I are eating dinner together at home, we’re having red wine, and we’re probably having chocolate afterward too. It might not be the most healthful of habits, but we love whoever said that a bit of red wine and dark chocolate are good for you, because we’ve surely taken it to heart. A few weeks ago we took a trip to San Francisco, Sonoma, and Napa and drank more than the recommended amount of wine and had the perfectly healthy amount of fun. We were joined by a group of my friends and I was practically in heaven with the beautiful weather, lots of great wine, and quality time with some of my favorite people. The fact that Ryan and I squeezed in a chocolate tasting too made it truly heavenly! So today I’m commemorating our trip and love for wine and chocolate with these dark chocolate truffles made from ganache infused with Cabernet Sauvignon, one of our favorite varietals. 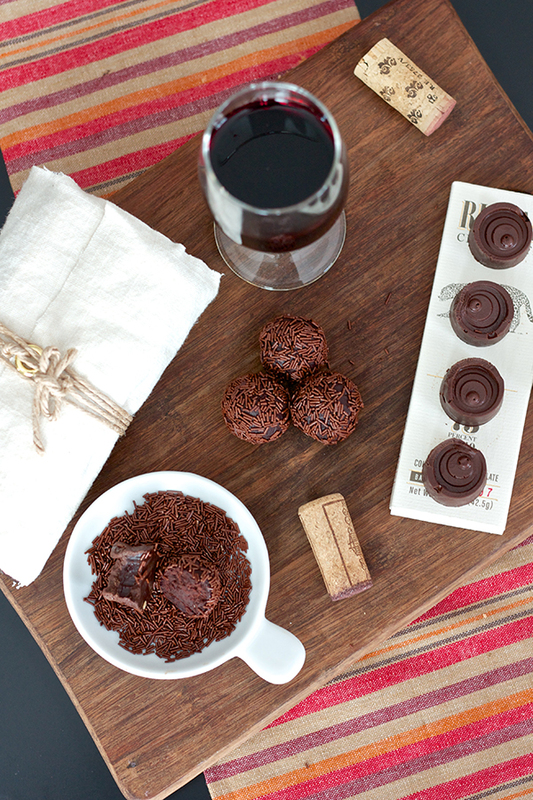 I actually made these truffles two ways to help show off the versatility of chocolate ganache that allows you to enjoy the flavor of good quality chocolate in either a rustic or elegant way. Ganache is simply a term for the combination of chopped chocolate and hot cream that can be used when it’s warm and melty to drizzle over a cake, when it’s slightly cooled to be piped onto cupcakes, or when it’s chilled to a semi-solid to be rolled into truffles. 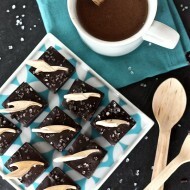 The truffles in the forefront in the photo above were made by lining chocolate molds with melted chocolate and then filling those shells with creamy ganache. The ones in the back are made of pure ganache that’s been chilled thoroughly, rolled into balls, and covered in sprinkles. You’ll find both versions referred to as “truffles”, but they’re definitely different as you can see here. I’m not sure which one I prefer – I love how fancy the ones made in molds are and the bit of crunch from the chocolate exterior, but there’s something about a simple rolled truffle that really make them special too. Maybe I’ll just have one of each, please! Whenever I make truffles (such as these almond joy truffles or dark chocolate blueberry truffles), I always reach for the highest quality chocolate I can find/afford. Since the ingredient list is so simple, it’s important to choose ingredients with tons of great flavor so the chocolate can really shine. I was fortunate enough to be sent a sample of craft chocolate from Bar & Bean to use for these truffles, and all of the bars they sent me are made from small batch artisan chocolate makers in the US. I learned that for a grocery store brand to call their product “chocolate”, they only need 10% of it to actually be chocolate. That’s crazy! 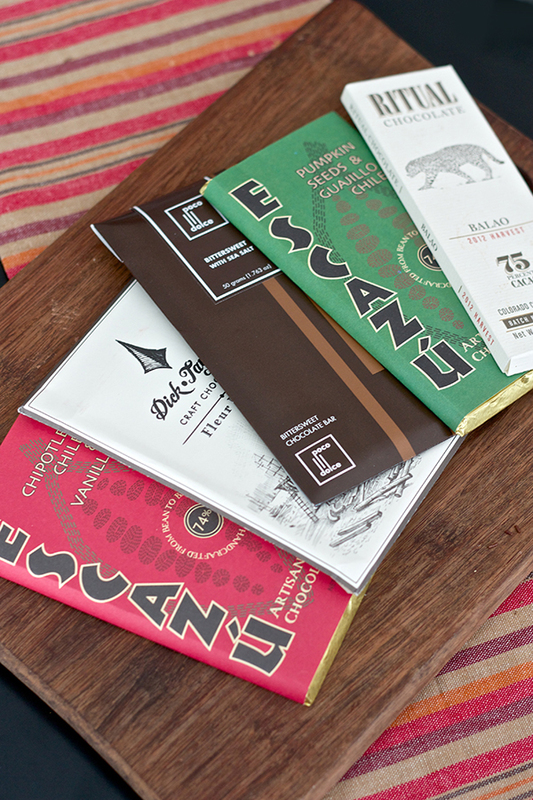 Craft chocolate strives to make the cacao shine, rather than masking it with sugars and other sweeteners. Instead of corn syrup, some of these bars had hints of things like sea salt, pumpkin seeds, and chile – very interesting and all very, very delicious! I love learning about chocolate, especially when it involves taste testing, and turning the chocolate into these truffles with a splash of red wine was a great way to test them out. 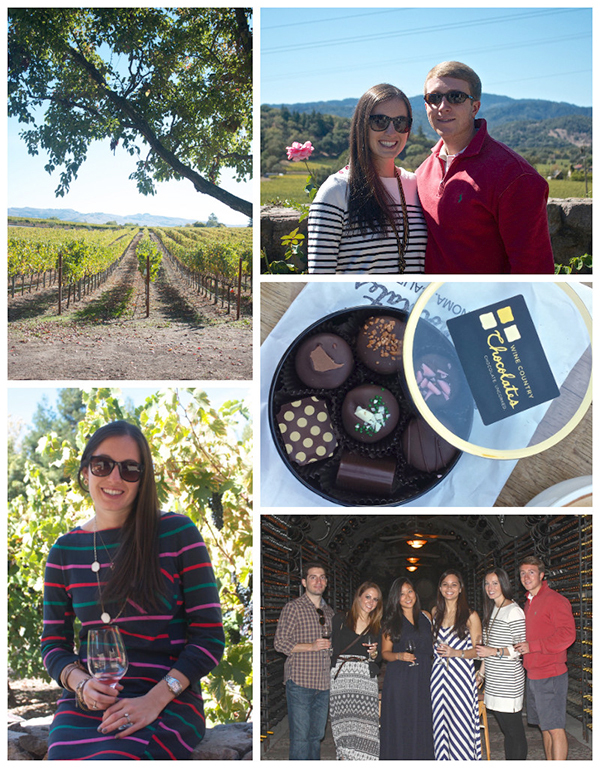 We enjoyed a chocolate tasting from Wine Country Chocolates while on the west coast (pictured below!) that were all yummy, but I must say these homemade ones definitely gave them a run for their money :) Using the craft chocolate probably had a lot to do with that! In addition to sending me a gift of 5 craft chocolate bars, Bar & Bean has also generously donated a Baker’s Set ($40 value!) to be given away to one of you!! And just in case you’re not the lucky winner, Bar & Bean is offering a 10% discount to Sweet Tooth readers – just use the code “craft” during checkout. Leave a comment on this post and make sure to leave a valid email address so I can message you if you win. Don’t worry, it won’t be made public! Contest ends Monday October 28th at 5PM EST. That’s National Chocolate Day!! And Ryan’s birthday :) I’ll announce the winner in next Tuesday’s post. Good luck!! 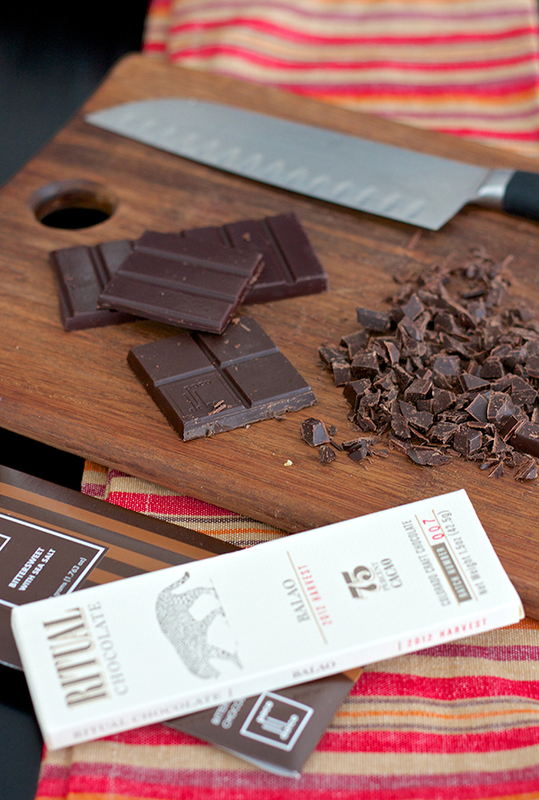 For the ganache, chop the 9 oz dark chocolate and set aside in a medium bowl. Over medium heat, in a small saucepan warm the heavy cream until bubbles just start to form. Once you see bubbles, pour the cream over the chopped chocolate and stir until completely smooth and melted. Add red wine and food coloring and mix until incorporated. Transfer ganache to the fridge to chill. If you're making the truffles in molds, you'll only need the ganache to chill for 5-10 minutes so it's at room temperature. Then spoon ganache into the chocolate shells, but not all the way to the top. You have to leave room for more melted chocolate so the truffle is completely sealed. Melt the remaining 6 oz of chocolate in the microwave and top the ganache with the melted chocolate to seal the truffles. Return them to the fridge until set, then gently unmold the truffles by pressing from the bottom. Store in the fridge until ready to serve, then allow them to sit at room temperature for about 10 minutes before eating. If you're making the freeform ganache truffles, the ganache should chill in the fridge for at least 2 hours. Once chilled, use a small ice cream scoop to portion out the truffles and use your hands to form them into balls. I like to return them to the fridge for another 20 minutes or so and then roll them again so they get a nice rounded shape (but I can never get them perfect!). After rolling them the second time, roll each truffles in chocolate sprinkles (or cocoa powder, or nothing) and return to the fridge. Just like the other form of truffles, take them out about 10 minutes before serving to allow them to come to room temperature without softening up too much. I never cease to be amazed at the sweetness of both your recipes and you! I’m so glad that I had the opportunity to meet a superstar like you during my “stint” at medical school! Wishing you continued success and only happiness! I’m following you on Bloglovin’. Chocolate – YUM. I didn’t know some of the things you mentioned about the quality of chocolate. Love the pic of you sitting on the wall, holding your wine glass. I’m already a follower on Bloglovin’. I LOVE your blog! I’ve been following it for over a year now! Oh my. Wine and chocolate.. my very favorite things! I’m just starting to learn more about the whole range of high-quality chocolate, and it’s very exciting (not to mention tasty!). I just “liked” you on Facebook. What a great combination ! I really enjoy reading your blog and all the great recipes. Love this post! I’m in Northern CA so love to head over to Sonoma/Napa area for great food and wine. I’ll need to add Wine Country Chocolate to my next trip! Thanks for the lovely giveaway!! I like you on FB and I am a Bloglovin’ follower. 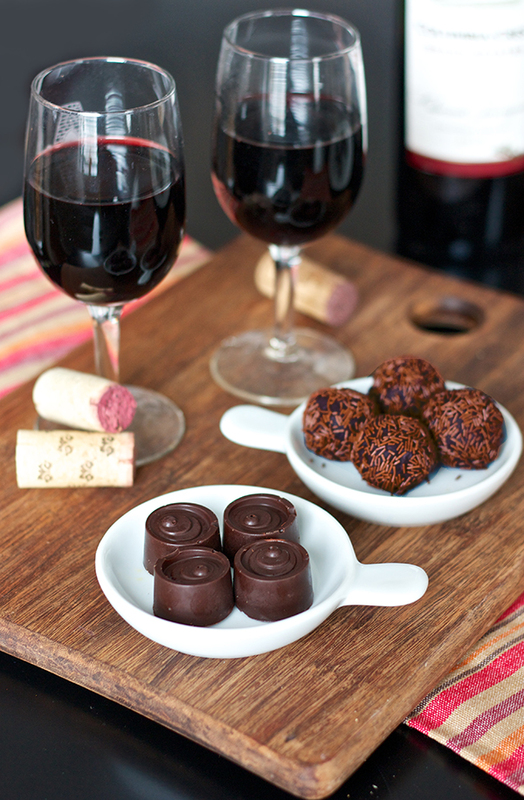 Chocolate and wine – yum! 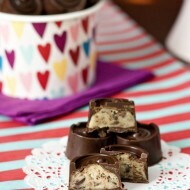 I’m a fan on FB and these truffles look delish! I think everything you make looks delicious but this one takes the cake. The two best things on Earth rolled into one?? I’ll be making these ASAP! Thank you! I follow you on Bloglovin’! Those chocolate bars look divine!! Would love to win! Those truffles look divine!!! You had me at molar cupcakes and I’ve loved your blog ever since! Since working at winery and serving people wine and chocolate all day makes me really crave some myself! I would love to get a chance to indulge myself!! Wine and chocolate are is the best inventions ever. I’m a fan on FB and also subcribed to you! Can’t believe that I wasn’t following you on facebook, I have you on my blogger list so I always get updates! Liked you on Bloggerlovin too! I <3 chocolate and the hubby loves it even more! Yum. I love truffles! They look so good. Your truffles look gorgeous! I’ve never been on a chocolate tasting before, but it sounds divine. And you’re giving away artisan chocolate made in the US? Yes please! Wow…these look amazing! And I love the idea of mixing Cabernet in with the truffles. Clever! I stumbled upon your blog after a friend of mine made your strawberry santa hat treats a few years ago. I have been following your blog (and now instagram and FB) ever since and love trying your recipes on my own… even sometimes making my own little tweaks. Thanks for the inspiration with every post! Shared it on Facebook for you! I follow you on facebook – yum! Red wine & chocolate; red wine IN chocolate?! The best flavor pairing since…since…I can’t think of anything comparable. Would love to try these chocolates! Mmmmm chocolate; I would love to win! Loooooooove chocolate and loooooooove your blog! Yayyyy for giveawayyys! Me again! Hoping this helps me win! Hm, it seems I have all of these ingredients readily available, although my chocolate is a bit subpar. Here again to express my appreciation for the giveaway and declare my deep, abiding love for chocolate. 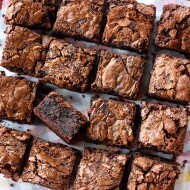 yum…these look wonderfully delish!! I can’t wait to make them!! Back again showing some love for your page and love for chocolate! Would love to win some chocolate! LOVE your blog and have followed it for years! These truffles look amazing! I “like” your Facebook page (FB name: Madeline Brubaker). And I adore chocolate, thanks for the giveaway! I follow you on bloglovin and like you on facebook. I love trying new chocolate in my baking. I like blending them in recipes, too, with some interesting results. Last entry? Our maybe I’ll sneak one in tomorrow! i follow on blog lovin – i love chocolate! Chocolate ? Do I see and smell Chocolate? Yummm! two of my favorites.. wine and chocolate!! My local artisan chocolate shop has some good seasonal truffles – the pumpkin is delicious! Cab and chocolate?! What could possibly be better? What goes better with wine then chocolate!?! These truffles look so good!